Not all of Uber's passengers are childless 20-somethings looking to stay out late with friends. Some riders have children, and it helps everyone involved if those kids have something to keep them busy. So Uber and Fuhu have come up with a way to keep to do precisely that. The uberFAMILY service, available first in DC, will equip cars with Fuhu's nabi tablets. In addition to apps, children will be able to take advantage of subscriptions containing both entertaining and educational content. Everything, from the custom interface to the content, is catered to younger folks. So these are not the most exciting tablets out there, and there's no reason for parents to dawdle on devices if the kids aren't interested. If that's the case, you're just out of luck. To keep the kids safe as well as occupied, parents who request a ride through uberFAMILY have the option to place their children in IMMI Go car seats. New users ready to get rolling can use the code "NabiFun" to get $20 deducted from their first ride. EL SEGUNDO, CA--(Marketwired - Mar 3, 2015) - Two technology companies are collaborating to make on-demand travel a more family-friendly experience. Fuhu, Inc., the creator of the award-winning nabi® tablet -- the first Android tablet built for kids -- and foremost innovator in technology for kids and their families, announced today a partnership with leading technology platform Uber for its uberFAMILY service. Through the uberFAMILY and Fuhu partnership, D.C. area families using Uber's uberFAMILY option may be picked up in cars equipped with Fuhu's nabi tablets featuring access to its nabi Pass mixed-media subscription service featuring Wings Unlimited education solution. 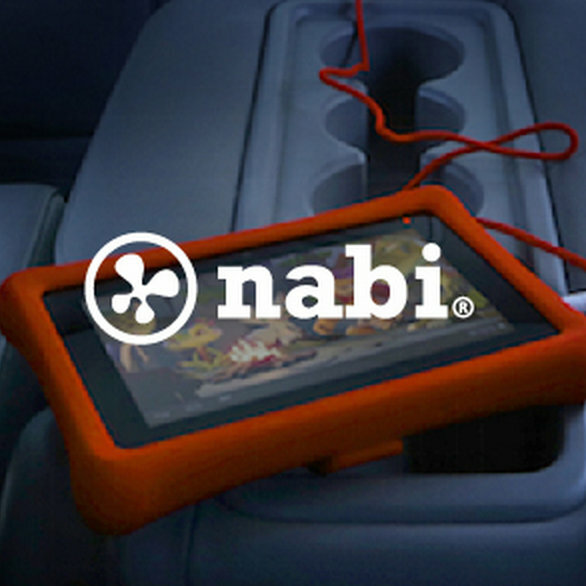 The addition of the nabi tablets to uberFAMILY further simplifies family travel as it is designed to keep kids engaged and amused with kid-safe and parent-approved education and entertainment content -- while giving parents a chance to have a moment to themselves without the worries of city driving. Jim Mitchell, CEO of Fuhu, said, "In collaborating with Uber on uberFAMILY, we are hoping to help them further build the ultimate on-demand family travel solution by transforming the much-needed service into something more -- an experience. Similar to Uber, we have always been a solutions-based company and by equipping their family-friendly cars with our technology, we are providing kid appropriate content and services that helps make car travel with kids a simpler, more appealing experience." Parents with children who request a ride through uberFAMILY will be able to secure their children in IMMI Go car seats and can provide them with nabi tablets equipped with nabi Pass and Wings Unlimited. Additionally, anyone new to Uber can sign up with the promo code 'NabiFun' to receive $20 off their first Uber ride (new users only, not valid on uberTAXI). More details on the uberFAMILY and nabi partnership can be found at Uber DC's blog: t.uber.com/fuhu. "We're always looking for ways to improve the Uber experience for our riders, and with nabi tablets featuring nabi Pass, uberFAMILY is not only going to be more enjoyable for children, but will continue to provide a seamless ride for parents, too," said Zuhairah Washington, General Manager for Uber D.C. "As two companies with innovative technology, this partnership is the perfect fit." nabi Pass was announced in December 2014 on nabi tablets. It marks a first of-its-kind mixed media content subscription service created and curated specifically for kids ranging from 3-14, featuring a complete learning solution through the Wings Unlimited educational platform and a deep offering of a vast array of good-for-the-brain content across TV shows, movies, apps, games, e-books and music from a growing list of top partners including National Geographic Kids, DreamWorks Animation, Cupcake Digital, Garfield and Walt Disney Records -- the exclusive music provider for nabi Pass. Fuhu's partnership with Uber comes on the heels of what has been an exciting 12 months for the company. Most recently, Fuhu was named to Fast Company's highly coveted 2015 Most Innovative Companies list, placing #24 overall and #4 in the consumer electronics category. Additionally, in early 2014, Inc Magazine named Fuhu the #1 Fastest Growing Company in America for a second consecutive year, and Forbes named Fuhu the #1 Most Promising Company in America. Fuhu was also honored as the #1 Fastest Growing Company in North America in the Computer/Peripheral category on the Deloitte 2014 Technology 500™ list. Fuhu also closed out 2014 to tremendous success, with the debut of a number of highly anticipated products including the category-defining nabi Big Tab HD ™ 20" and 24", the nabi DreamTab™ HD8, and the recently launched nabi Pass, a first-of-its-kind subscription service for kids featuring unlimited learning with Wings Unlimited, apps, games, videos, books and music, refreshed and curated specifically for kids ages 3 to 14.